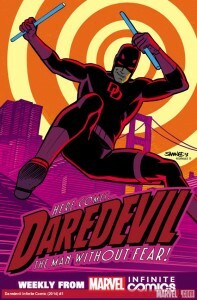 Marvel.com also spoke with artist Peter Krause who, as it turns out, is a huge Daredevil fan. I like this guy! (And I was already a fan of his work on Thrillbent’s Insufferable.) Considering that Krause 1) has already worked extensively with Mark Waid, and 2) is very familiar with the digital format, this should turn out to be a great-looking story! I’m also really curious about what can be done with Matt Murdock’s senses in a slightly different mode of storytelling. The cover is by regular Daredevil artist duo Chris Samnee and Javier Rodríguez, as seen on the right, and I can only assume these guys are attached to do the rest of the covers as well. There’s no information, at least as far as I can see, about how many issues (installments?) of this digital series we’re getting, but I assume it will be weekly, as has been the case for other Infinite Comics stories. 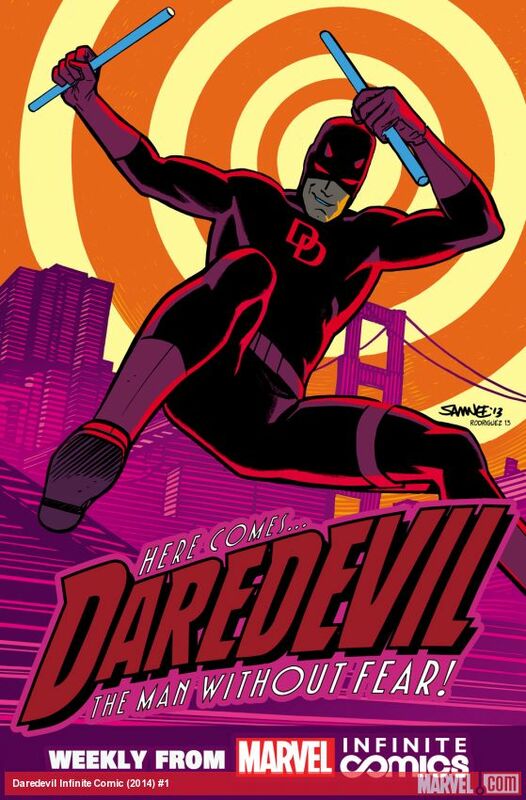 I also doubt that we will be going without a traditional printed Daredevil book for very long, so I see this as the first announcement of its kind, as we’re heading into Daredevil’s 50th year. I guess we just have to stay tuned! I gotta say I think this is a unwelcome gamble on Marvel’s part. Daredevil has a small but mostly loyal and devoted fan base and the response to this online has been overwhelming negative. Most, like myself, seem content to wait for the hopefully eventual trade of this story and have no desire or intention of purchasing this digitally. I can also speak for two of my friends who read DD, one of whom runs one of the local comic shops, and now one is excited about this. None of his unfortunately few customers who collect Daredevil are planning to purchase this. I really hope they pack it in a TPB afterwards.